Reading back through my blog I notice that there’s a focus on one of my two previous employers Bell Labs. I’ve been lucky, I’ve had two amazing previous jobs, Bell Labs and Xerox PARC. But, for a variety of reasons some of the most significant lessons I learned, I learned at Bell Labs. Given the focus of this blog, that’s not surprising in a way, the lessons I am frequently drawing on are ones of implementation. At PARC, I was more isolated from Xerox, given that it was largely on the other side of the country (well that’s how it felt). Bell Labs sheer sustained scientific history, that was a bit terrifying also… but it’s not like PARC was not amazing. And one day sums it up quite well. The opening address was by Bob Metcalfe. Bob, who came back to visit also walked around CSL. It was fun to learn that his office was currently being occupied by Keith Edwards. Bob Metcalfe talks from note cards. The note cards are annotated with wonderful pictures. I knew this because I had seen some of the diagrams in his original account of Ethernet. I was delighted to see them in person as he talked. He gave a talk called Ethernet vs. Godzilla. I know because I still have my program. There’s one in the Computer History Museum. Cool. There were many other talks and panels that day. What was amazing to me was the sheer number of people who were there. On that day I had an opportunity to meet Vint Cerf, David Liddle, Judy Estrin, David Boggs, Bob Taylor, Andy Bechtolsheim, and Ann Winblad among many others. So there I was surrounded and alone. I was surrounded by a who’s who of the invention of the things that I am using to write this blog, and that I study. I was alone in that I hardly knew where to begin. And many of these people knew each other. A circle of innovation. It was a day where I learnt so much. It reinforced a lessons I thought I had already known, but it really solidified it for me. There was a reception for everyone who had presented. I did a lot of listening. The conversations were mind-boggling, these were people who had frequently leapt from one success to another. It felt that way to me. And what I never heard was discussion divided along disciplinary lines. Here were some of the people who not only changed the world of computing practice, but of Computer Science research. And I had the distinct impression that they did it without too much regard to which area of speciality they were in, whether it was an appropriate contribution for that area. 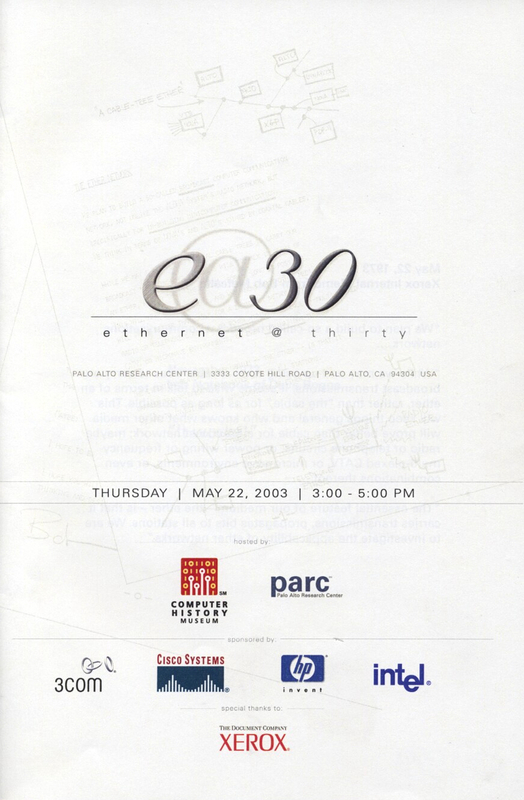 PARC was much bigger than the 30th Anniversary of Ethernet. It was a place where anyone who worked in Computer Science wanted to see. It was an interesting place to see. I worked quite close to one of the pads that Mark Weiser and others built to experiment with a Ubiquitous Computing future (we won’t talk about the time I crashed it, whoops). I was in the building the night that they removed most, but not all, the original ethernet and put it in dumpsters as part of the upgrading. Funnily enough that was the night I left with some cable. And even funnier to me, it’s in my office, and every day people walk right past it … and perhaps they just think it’s old cord or more of the junk that populates my office. But it is computer history, and one that was built by people who at least to me, who on that day was very much an outsider peaking into a world of Computer Science research of the highest impact, just seemed to want to work on good problems and produce creative results. In so doing they defined Computer Science. Wow.